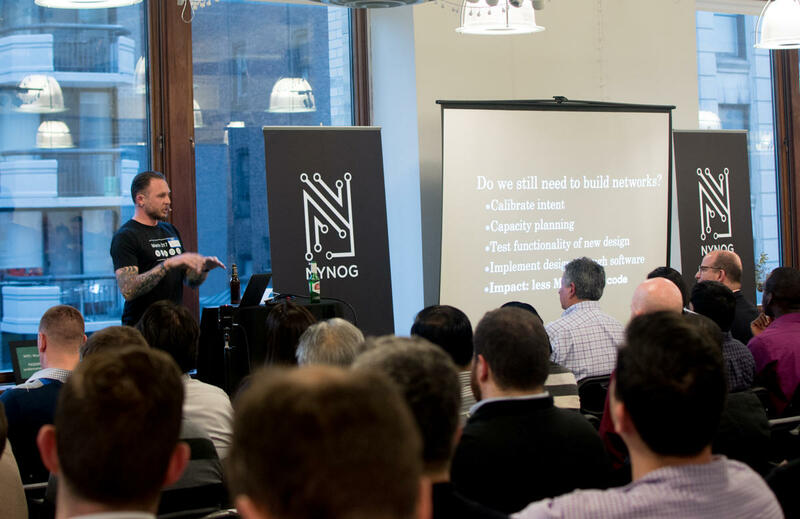 NYNOG (New York Network Operators Group) is connecting New York network operators and technology professionals by providing educational events and programs. Join us at Perseus on Thursday, June 22nd, at 5:30 PM for our second meetup of 2017. NYNOG #4 will feature technology and trend talks presented by members of our community followed by networking with appetizers and drinks on the roof! industries network engineers build for. 2. You support NY infrastructure. 3. You like good food, good drinks, and good company! *Space is LIMITED for this event. Please make sure you are able to attend when registering* Thank you! and prepare for what's next. around network disagregation and Quantum. Check out the Perseus ROOFTOP! The view is incredible. See you at the next meet-up! Yan Filyurin will be helping us make sense of the current state of disaggregated software and hardware market. He'll examine what disaggregation is all about, what hardware and software devices fall under that umbrella, what interesting use cases are possible and all kinds of things that can go wrong. He'll talk about numerous device hardware components that make it possible to install and operate independent operating systems, and, yet again, all kinds of things that can go wrong. Despite these issues, dabbling in these dark arts is the only way to move forward. Software Defined Networks (SDN) have become prolific contenders in networking with the advent of containerized infrastructure, but many falter as applications push toward the edges of the internet. The promise of SDNs to solve some of the most challenging connectivity and orchestration problems that teams face operating containerized systems leaves certain key issues unresolved for servicing highly dynamic and globally distributed infrastructure. Christian Saide explicitly diverged from the standards adhered to by the current generation of technology and built from scratch an SDN called quantum. While most SDN’s focus on enabling inter-container communication between intranet hosts and operate with the fundamental idea that all containers should have an IP address, quantum focuses on enabling simple, secure, and automatic inter-host communication over the WAN. Christian will detail his experiences working with many of the current technologies and specifically what brought him to the decision to build a radically different one - delving into all of its challenges, failures, and successes. We started NYNOG as a way to bring networking and IT professionals in the New York City Metro area together through our small and intimate events that we host throughout the year. People get together and learn about new technologies, discuss problems and challenges they face with changing infrastructure, or just come to meet other like-minded professionals.